60 double-sided laminated flash cards including numbers 0-100, addition, subtraction, division and multiplication symbols as well as fractions. This pack is ideal for teachers, parents and carers who are looking to teach basic mathematical skills to children aged 3+, aiding the child to learn to basic mathematical concepts. What are the missing numbers? Lay out the odd numbers, e.g. from 1 to 19 or the even numbers from 2 to 20. Ask the child to name the missing numbers in the sequence. They then turn over each card to check if they were right. One more, one less – Lay out a series of odd numbers, at first up to 9. Ask the child what is one number more than each number. As they answer turn over the card to check if they were right. Use the even numbers to ask what is one less than each number. All in order – Lay out a series of four or five random numbers between 0 and 10. Ask the child to put them in order, lowest to highest, or highest to lowest. Tigger at age four is due to start school in September, something that he is looking forward to and if I’m honest I am looking forward to as well. A combination of having an older sibling and attending a good pre-school means that he is already quite confident when it comes to counting and number recognition. Mr Boo has always been good at maths and I think that Tigger is following in his footsteps so I’m hoping that starting school will help stretch his maths knowledge. 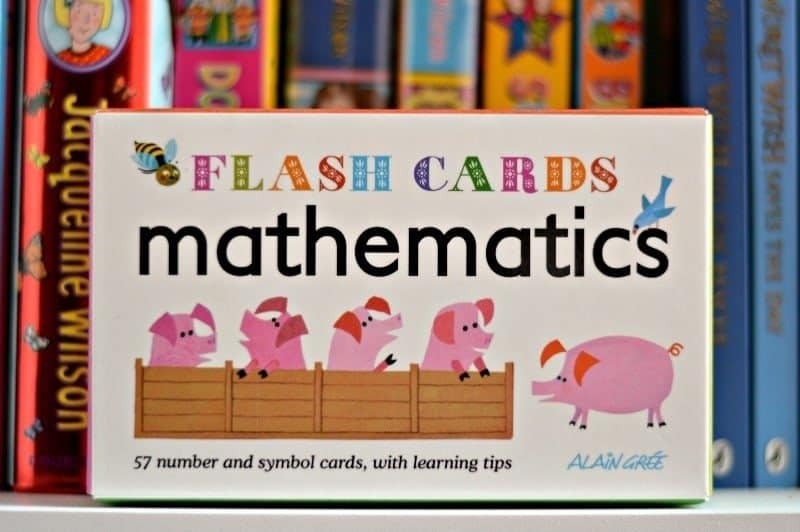 These Mathematics – Flash Cards are the prefect way to help him with simple addition and recognising number patterns. I can see these being useful for him over the coming years as he learns to add and subtract etc. Available from Button Books with a RRP of £5.99, these are a great way to introduce your little one to numbers before leading onto counting, adding, subtracting etc.